Posted on November 9, 2017 April 24, 2019 , in Hot Tubs. Hot tubs have many options when it comes to where they can be located, however, there are still a number of things that you need to consider before you decide where you will install your new hot tub. Choosing the best location has a lot to do with how you plan on using your hot tub and your lifestyle. There are many options available and below we will discuss the top factors to consider before making your decision. Although outdoor hot tubs are incredibly popular, they can also be installed inside of your home. A hot tub can provide a focal point for a backyard or act as a complement to an indoor gym or sauna. Their versatility allows you to decide which location is best for you. Understanding the different seasons in your area will play a role in deciding on the ideal hot tub location. If your area is particularly rainy or cold for long stretches of time, you may consider a different location than if you experience sun and hot weather all year round. Knowing your yard’s sunny and shady spots and your preference for either is also something to think about. If you have areas on your property that are more windy than others, this can also play a role in deciding where to install your tub. Making sure your hot tub is equipped with privacy will allow your family and guests to relax without worry. There’s also a safety element to ensuring privacy as it will prevent curious neighborhood children and passersby from wanting to get a closer look when you’re not around. Employing proper fencing, landscaping or enclosures will enhance your privacy and decrease the worry associated with unwanted visitors. Having a hot tub located close to a bathroom or changing area will make it more easily accessible and appealing. A long walk to and from the house or changing area, especially in inclement weather, will not only track dirt and debris everywhere, but also decrease the use of your hot tub. Making sure you have enough space is a very important consideration when deciding where to install a hot tub. If surrounded by a deck, ensuring there’s a logical and comfortable entry and exit point is something to keep in mind. Surrounding trees and vegetation can play havoc with a hot tub’s water quality, therefore you should keep this in mind before installing a tub too close to leaf or pollen shedding plants. Keeping in mind your yard’s existing structures such as pathways, light fixtures and decorations will ensure the hot tub is installed in an ideal location. 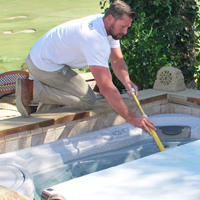 Hot tubs are very versatile when it comes to choosing an installation site. Consider the various factors affecting your location before deciding on where to install your hot tub. Choosing the ideal site will have a lot to do with how you plan to use your tub, the layout of your property and your own personal preferences. Feel free to download a hot tub buyer’s guide to learn more about hot tubs and their benefits.